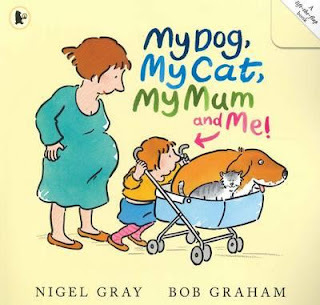 Kids' Book Review: Review: My Dog, My Cat, My Mum and Me! Review: My Dog, My Cat, My Mum and Me! A little girl notices her dog getting fatter and fatter, though she can't figure out what is the matter. Finally, the dog hides away and the little girl goes to investigate. In my experience, toddlers can never resist a good Lift-the-Flap book, and they will love lifting this flap to see where the dog has hidden, and finding that she has had two little puppies! Next, the little girl notices that her cat is getting fatter and fatter, and she can not work out what is the matter. The cat also hides away and there is a flap to lift to discover that the cat has had three little kittens. Finally, Mum gets fatter and fatter. This time the little girl has clued on (she knows what is the matter!) and she waves goodbye as Dad takes Mum to the hospital (no hiding in cupboards for this Mum's birthing experience!) But what a surprise everyone will get when the final flap is lifted to reveal four little baby brothers! Told in flawless rhyming text, Nigel Gray has delivered a gorgeous story for very young readers about where babies come from, without any of the gory details. Bob Graham's whimsical illustrations perfectly capture the worn out look of a new mum (in both animal and human form), as well as the energy and love that new little creatures bring into a home. My Dog, My Cat, My Mum and Me! is one of the few books I have seen that features multiple births (particularly beyond twins) and is a truly delightful and creative book about newborn babies.